A pair of downtown officers had the chance to share in the celebration of a retired officer’s 99th birthday, and thank him for his service to the city as well as to his country in World War II. Constable Nam Le has had an interest in World War II and its history since he was in high school. “I love reading any material pertaining to the subject,” said the 52 Division Community Response Unit member. When he and Const. 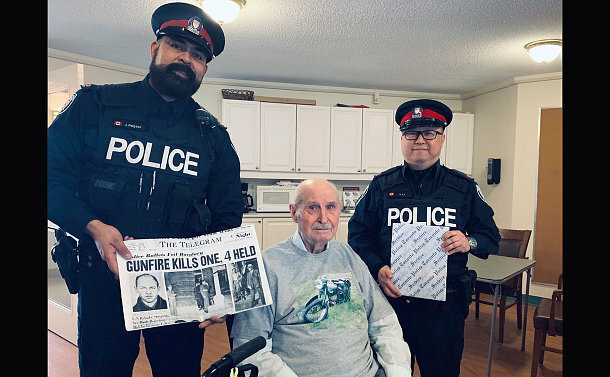 Juan Carlos Delgado were chosen to visit a retired Toronto Police officer who served in the war, he was obviously elated to connect with the retired officer. On March 13, they attended the Chartwell Rogers Cove Retirement Residence in Huntsville, to meet Melvin Bartman who was a Service member from 1947 to 1978. Bartman, who celebrated his 99th birthday on March 9, was born in Lionshead and raised in the Bruce Peninsula. He was an Imperial Oil tanker operator/fireman when the war broke out. In 1941, he joined the Royal Canadian Signal Corps Fifth Canadian Artillery Unit, and was dispatched to Scotland before being transferred to Palmero in Sicily and then mainland Europe. Back home after the war, Bartman rejoined Imperial Oil before going to Nipigon to work, cutting trees for a pulp and paper mill company. Following the footsteps of an older brother, he became a Toronto Police officer in 1947. Starting his law enforcement career at #2 Station, at Bay & Dundas Sts. where he spent 15 years, Bartman said the beat was busy dealing with bookies and prostitutes. 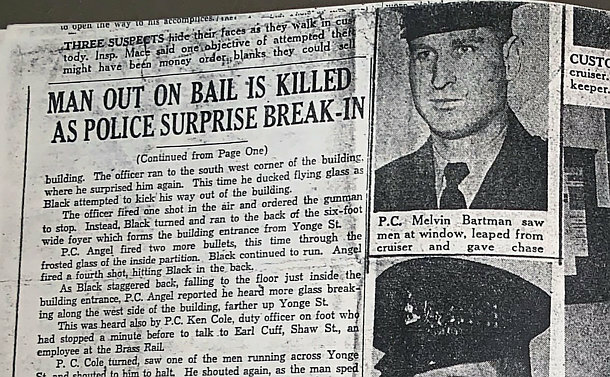 He also recalled an incident on August 25th, 1951, when he and three other officers rolled up on a robbery in progress in the Yonge and Bloor Sts. area. He said one of the suspects, John Black AKA Joseph Sarasky, fired at police as he was attempting to escape. 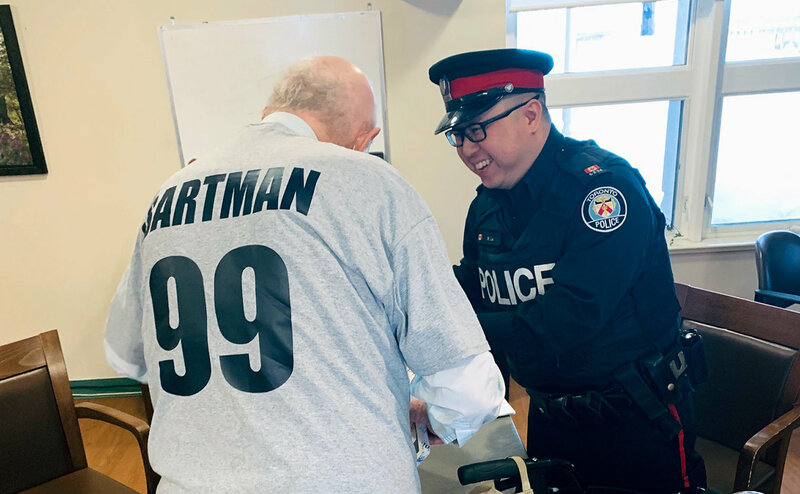 Bartman was assigned to #1 Station, and then 54 Division in East York and retired after working six years at Old City Hall Court. Julie Martin, the Lifestyles & Programs Manager at Bartman’s retirement home, says he often passes his time by reading books on military history. Supt. Michael Barsky said he became aware of Bartman through retired S/Supt. Rick Stubbings, and wanted to ensure the Service celebrated Bartman’s good health and contribution to the Service, the city and country. “The moment I heard about him, I said we have to go see this guy and tell him how proud we are of what he had accomplished,” Barsky said. Le and Delgado presented Bartman with a copy of a Toronto Police Service history book, a plaque, mug and challenge coins.